Thanks to constant developments in colours for the world of decoration, BARPIMO has positioned itself for its own merits among the companies that are a benchmark in what has been called "trends," that is, in launching colour ranges that truly are not only the most used in modern decoration but also clear indicators of the direction colour styles applied in architecture and interior design will take in the next few years. While decoration in our country has moved in a few years from being dominated by the white empire to be invaded by the use of an ever wider colour pallet used many times without highly defined harmonic aesthetic criteria, today this unusual colour boom is established and rationalised, opening a space for trends that serve to create styles, a space for tranquillity, for the creation of increasingly defined and meditated environmental concepts, where creators find inspiration... Here is where BARPIMO Inspiration is born. • High print quality and paper weight. Novel format, never used before in the industry. • Made with colours by deposition on both main page and interior pages. • Reliable colours: Colours were manufactured with a 100% match to the colours shown on the catalogue and the store display. • Strong colours and soft colours, with easy to remember, simple, and natural names. • A wide range of colours is offered: From white to black, going through reds, blues, greens, and yellows. 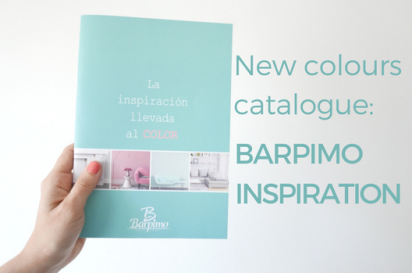 BARPIMO Inspiration 16-colour range and chart in novel format, introducing each colour through high quality environmental images and accompanied by a real paint sample by deposition. BARPIMO, besides being one of the pioneers in paints development with EcoLabel certification and A+ certification for indoor air quality, launched the HABITAT plastic paint a few years ago which also, due to its formulation, has set a trend. This has demonstrated the path being followed by the technological evolution of the launches made by main industry manufacturers. The success of HABITAT is once again a sign of BARPIMO's vision, which is ahead of the future development of the decorative market. Now, bringing the extraordinary qualities of HABITAT together with its experience in the world of colour and decoration, BARPIMO has created BARPIMO Inspiration, a new catalogue of trendy colours that seals its recognition as a brand that has been able to place itself at the forefront of the segment of colour and decoration specialists who truly create fashion. BARPIMO Inspiration is made up by 16 colours of exceptional aesthetic quality, targeted to the architecture and professional interior design, as well as to the decoration needs of the general public. The chromatic range is presented in a chart, which is already available in paper on a novel format, 17 cm. x 24 cm, as well as digital. 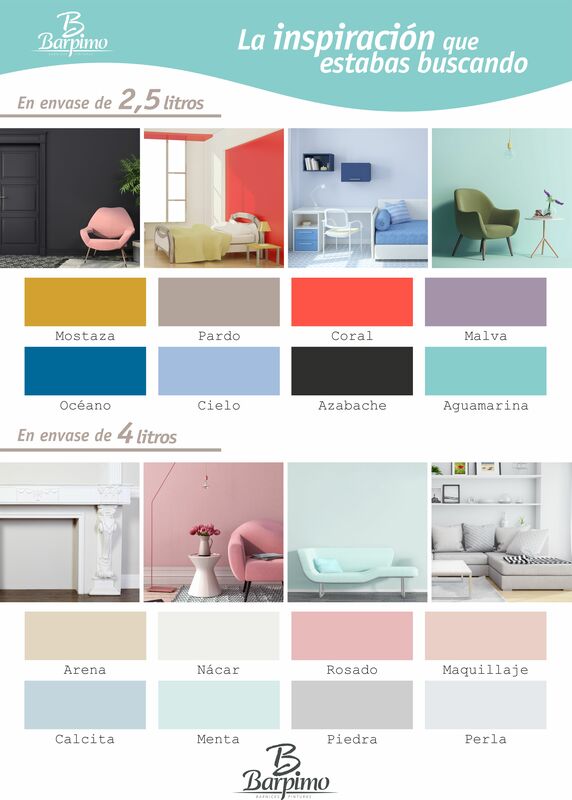 With an attractive and simple design, it presents the natural, elegant, contemporary, and timeless colours that allow multiple combinations that adapt to all interior styles, to address the needs and tastes of all customers, always providing a professional finish with its use. Description: Matt, ecological, washable, high quality, water-based plastic paint made with acrylic-vinyl resins and high-strength pigments. Provides highly decorative finishes. Applications: Suitable for indoor surfaces such as walls, roofs, etc., and general decorative projects. Performance per coat: 8-10 m2/L., depending on the surface structure. Drying: to touch: 30 minutes. Repainting: After 2-4 hours. Colour tones with great coverage and filling capacity. Smooth, even, hard, washable, and decorative finishes. Does not drip or splatters. - Ecolabel certification and A+ certification of indoor air quality. - It has been manufactured according to the requirements of ISO 9001 standards on Quality Management Systems and ISO 14001 standard on Environmental Management. - BARPIMO is OHSAS 18001 certified for occupational health and safety. - With the ECOEMBES green dot, BARPIMO ensures that the packaging will be recovered so as to be properly handled, thus avoiding pollution. 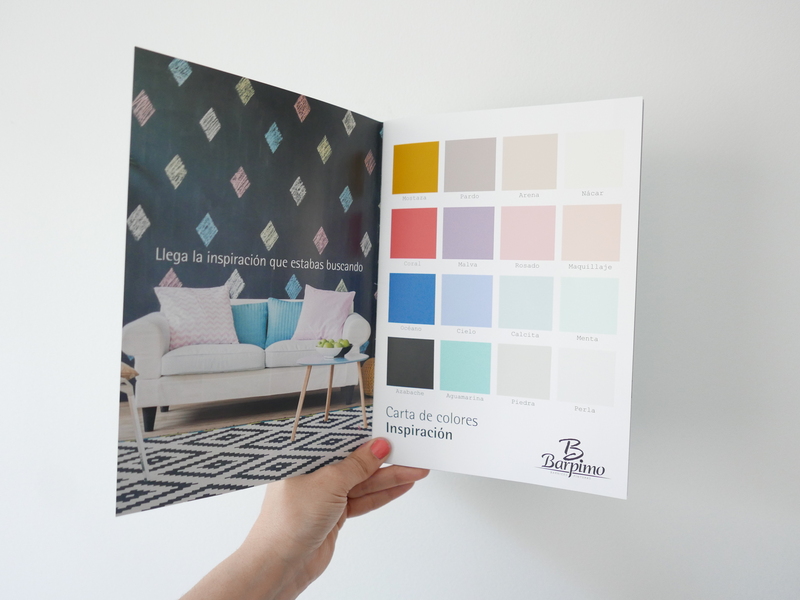 To develop this catalogue, the BARPIMO Marketing team attended decoration exhibitions and made a careful study of the colour trends of the main brands in the industry at an international level, selecting the best of each colour range. HABITAT, Ecological Matt Odourless Plastic Paint, is the base for BARPIMO Inspiration. Its top quality 16-colour range -"HABITAT quality"- for interior decorating represent a true incentive for the imagination of decoration enthusiasts. The new colours are available for sale in two rectangular tin formats: 2,5 L. y 4 L. Both include a built-in mesh on the container. 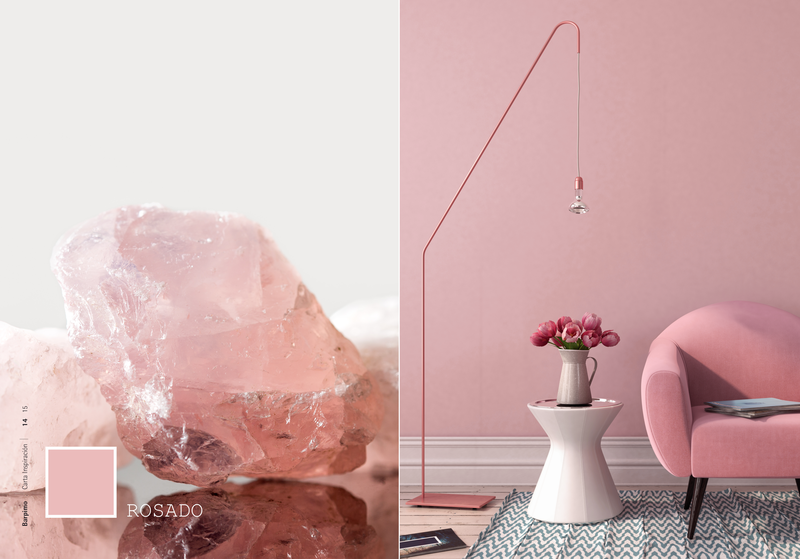 In the world of interior design, where all the arguments and styles are allowed and in which the classic concepts are renewed and mixed, BARPIMO Inspiration becomes a favourite option for all those who love the best decoration culture upon which the essence of the contemporary quality of life is built.